Well, Ning Zetao SUX in this Olympics. He FAILED in qualifying for finals of 100 meters and 50 meters free style !!! And the China relay team in 4 X 100 meters free style relay got disqualified. So Ning Zetao will return to China EMPTY HANDED !!! NOT SURE WHETHER he did that ON PURPOSE !!! Right before the name list for Olympians was disclosed, there were RUMORS that Ning Zetao was AT ODDS with officials at the China Swimming Association, and that he would not be picked for this Olympics; like Sun Yang, Ning Zetao had participated in too many commercial activities and got too many commercial endorsements WITHOUT CONSENT AND APPORVAL from China Swimming Association, which had irked the officials. Also there were rumours that Ning Zetao had submitted his retirement request to PLA Navy last year (after the 2015 Kazan World Aquatics Championship) requesting to be released from military service, which had yet to be approved. SO MAYBE HIS HEART IS NO LONGER IN HIS SPORTS and he wants to retire and get REAL $$$$$$$ from the entertainment industry, cos he thought has this HANDSOME FACE and HUGE FAN BASE !!! 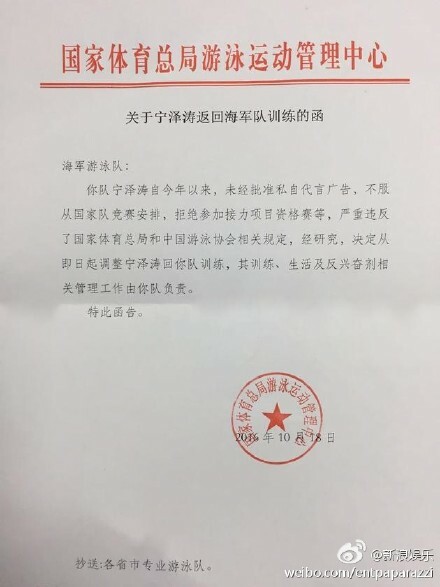 It's CONFIRMED today that right after the Rio Olympics, his idol Ning Zetao got his @$$ KICKD OUT of the national team and sent back to his PLA Navy team since October last year. He won't be representing China in the forthcoming 2017 World Aquatics Championships to be held in Budapest, Hungary from July 14–30, 2017.
wahahahaha, there are so many new Chinese swimming stars, way more than basketball stars. This pryuen's idol Ning guy is even worse than pryuen's new idol, the Ding guy. wahahahaha, this Ning guy is making a come back, trouncing pryuen's idols. YEAH just keep WET-DREAMING about his comeback !!! WAKE ME UP AFTER your big FVCKING IDOL Ning Zetao gets REINSTATED into the national team after he got he BIG @$$ KICKED out of the national team 3 years ago. wahahahaha, they still have swimming stars like Xu Jiayu, Li Zhuhao etc and many other youngsters easily trouncing big Yao Ming who is now in Dubai wining and dining. pryuen's big idol Ning Zetao is now retiring, because of pryuen's conflict.